I know fish tacos are popular (especially in Cali) but I have a weak spot for shrimp! I sometimes find it hard to find a good fish taco at restaurants. They are either too fried, fishy or soggy. I’m not saying it is always the case, but with my experience it’s pretty common. My safe bet has been to order shrimp tacos. They are usually grilled and well it’s shrimp, how can you go wrong? Making homemade fish tacos could lead to a similar scenario, especially if you are frying the fish. When you don’t have a professional fryer at home, let’s face it, it’s kind of a mess and a challenge to maintain the right oil temperature for frying. We will perfect that another day. Final decision, let’s stick to shrimp tacos for now!! The chipotle marinade for this recipe is easy to make and well worth the time. You won’t be able to resist eating the shrimp right off the grill. I love the smoky flavor of the chipotle sauce. If you are not familiar with chipotle peppers in adobo sauce, they are canned and can usually be found in the Specialty or International isle in most grocery stores. I always keep a spare can in my pantry. When opened you can reserve the remaining peppers with the sauce in a small covered container and refrigerate for later use. Along with all of the delicious and necessary toppings for the tacos, the Cilantro Lime Sauce is amazing. The thin consistency makes it easy to drizzle all over your tacos. Drizzle, drizzle drizzle…I can’t believe I’m saying this about sour cream, but it’s so good! If you start to feel a little guilty, don’t worry, keep drizzling, at least it’s made from scratch! The recipe calls for 2-3 serrano peppers. Some peppers may be spicier than others; it’s your call on the level of heat for the sauce. There is no right or wrong way to assemble the tacos. Lay the ingredients out and stack your tacos to your liking. Pile them high and dive in! 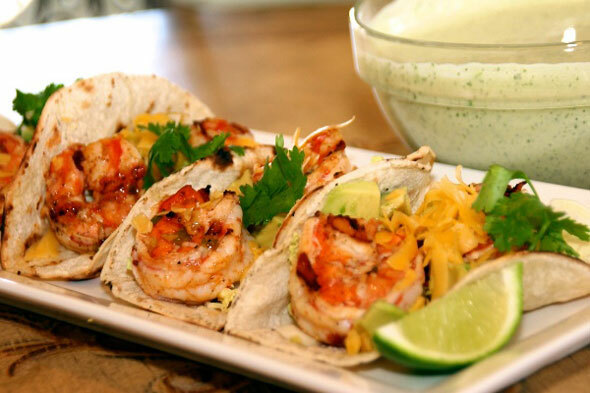 The chipotle marinated grilled shrimp combined with the delicious taco toppings and spicy yet refreshing cilantro lime sauce will leave an intense flavor in your mouth that will make you wonder why you never made homemade shrimp tacos before! There are no rules on how to assemble your tacos here. My recommendation is to pile it up and be generous with the sauce! Prepare Marinade: Combine green onions, mashed chipotle peppers, garlic, lime juice, salt, and pepper in a medium-mixing bowl. Slowly whisk in olive oil. Add shrimp to marinade and combine. Cover and refrigerate for 30 minutes or up to 1 day to allow flavors to absorb. Prepare Cilantro Lime Sauce: In a food processor pulse serrano chile peppers, add cilantro and pulse until finely chopped, add lime juice, chipotle sauce, salt, pepper, sour cream and blend. Scrape down sides and blend until combined. Pour in a small bowl, cover and refrigerate until ready to use. Prepare Shrimp and Assemble Tacos: Set barbeque grill to medium-high heat. Skewer shrimp on preferred skewers (if using bamboo, soak in water 30 minutes prior) leaving room on each end to handle. Heat desired number of corn tortillas on grill then set aside. Lightly spray grill with non-stick cooking spray. Place shrimp skewers on the grill side by side and cook until just opaque about 2-3 minutes per side. Remove from grill; slide the shrimp off of the skewers. Serve with warmed tortillas, cilantro lime sauce, shredded cabbage, cheese, avocado slices and cilantro sprigs. *Cilantro Lime Sauce can be made up to two days ahead. If sauce thickens, stir and bring to room temperature. *Use 2-3 serrano peppers for the cilantro lime sauce depending on your preference of heat. Some peppers may be spicier than others.